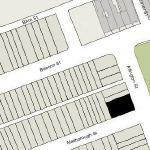 6 Arlington (0 Marlborough) is located on the NW corner of Arlington and Marlborough, with 4-5 Arlington to the north 8-9 Arlington (00 Marlborough) to the south, across Marlborough, and 1 Marlborough to the west. 6 Arlington (0 Marlborough) was designed by architects Strickland, Blodgett, and Law, and built in 1929 as a ten-story, eight-unit cooperative apartment house (at 6 Arlington) and clubrooms for the Junior League Club (at 0 Marlborough). The League previously had been located at 6 Commonwealth. 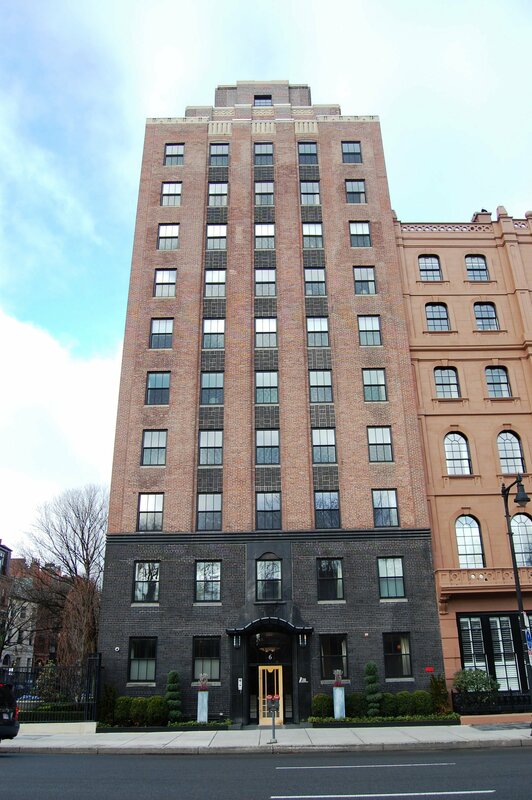 6 Arlington was built for the Six Arlington Street Trust (Elliott Henderson, Frederick Holdsworth, and Gladys B. Olmstead, trustees). On March 3, 1928, the Trust had acquired the townhouses at 6 and 7 Arlington from a trust established by Charles C. Walker of Manchester. It subsequently razed the two townhouses and had the new apartment house built with the address of 6 Arlington. The Six Arlington Street Trust is shown as the owner on the original building permit application, dated May 24, 1929. Click here for an index to the deeds for 6 Arlington. Architectural plans for the building — including elevations, floor plans, land plot plans, and foundation and other structural plans — are included in the City of Boston Blueprints Collection in the Boston Public Library’s Arts Department (reference BIN B-9). The Junior League formally opened its clubrooms at 0 Marlborough on October 8, 1930. It occupied two floors, with an auditorium/ballroom on the ground floor and a lounge and kitchen on the second floor. 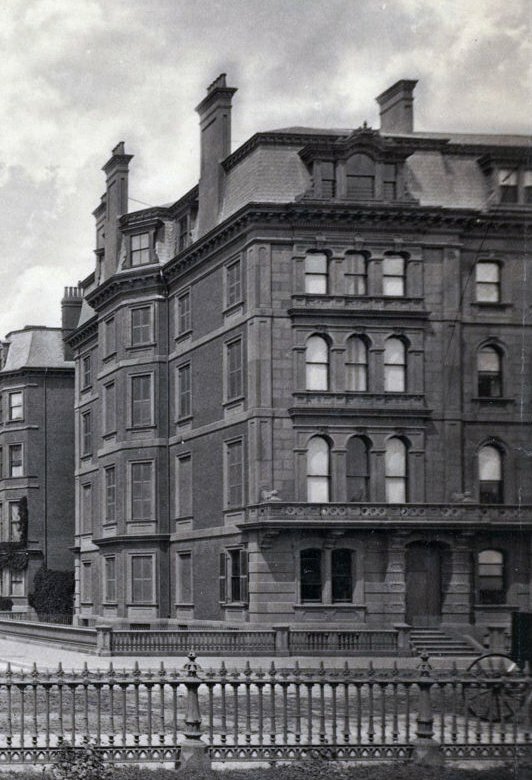 On January 25, 1934, the Six Arlington Street Trust transferred the property to Six Arlington Street, Inc. In mid-1953, the Katharine Gibbs School acquired 6 Arlington through the purchase of the shares of Six Arlington Street, Inc., which remained the owner of the property. In its August 19, 1953, article on the transaction, the Boston Globe commented that “the purchase of this property…ends a search of several years for a building that would place under one roof all of the school’s activities now housed in six units throughout the Back Bay.” That same month, the school sold five of its six buildings: 135 Commonwealth, 151 Commonwealth, 303 Dartmouth, 90 Marlborough, and 92 Marlborough. It retained the sixth, at 21–23 Marlborough, and converted it from a dormitory to classrooms. 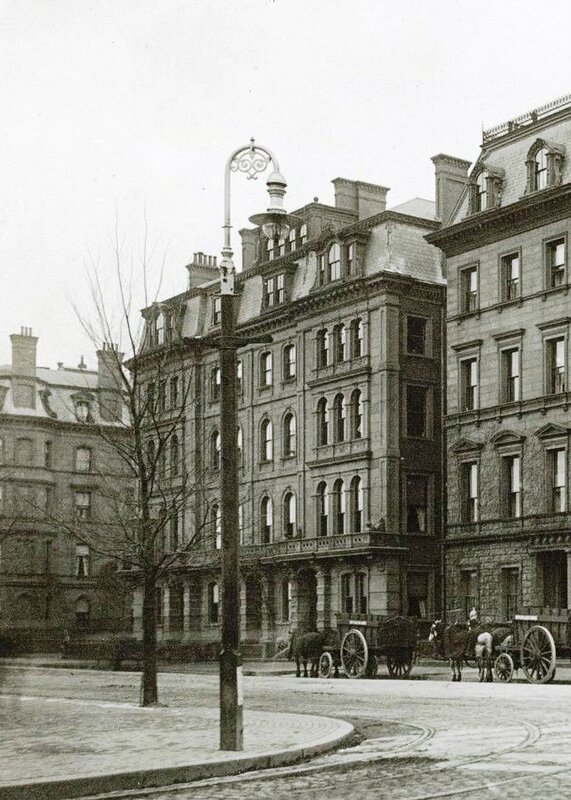 The Junior League relocated to the Harvard Club at 374 Commonwealth, where it remained until 1958, when it purchased its own building at 117 Newbury. On June 25, 1959, Six Arlington Street Inc. (Gordon Gibbs, president) transferred 6 Arlington to the Katharine Gibbs Realty Trust (Gordon Gibbs, Blanche L. Gibbs, and Edward L. Kane, trustees). In May of 1962, Katharine Gibbs School also acquired 4-5 Arlington and in July of 1962, it converted the buildings into a dormitory, with doors cut through to 6 Arlington on several levels. 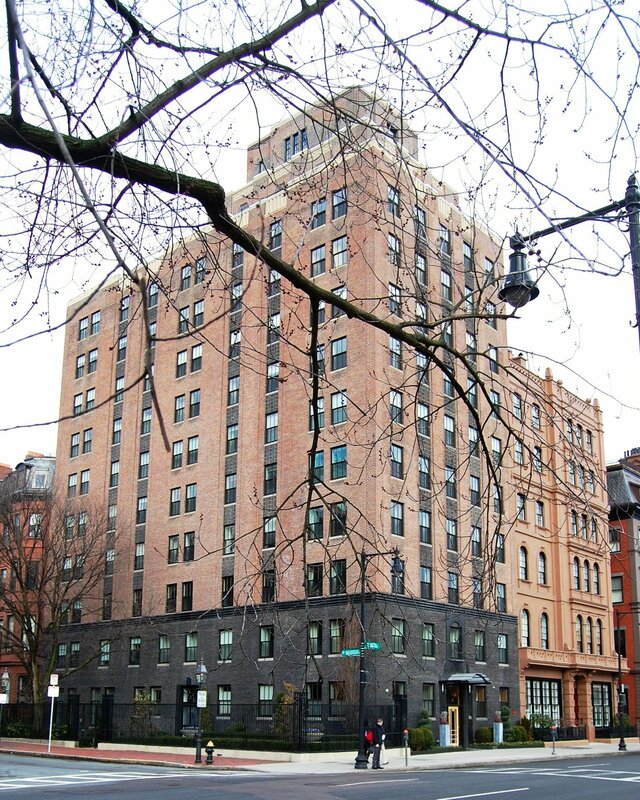 On February 29, 1988, the Katharine Gibbs Realty Trust sold 6 Arlington to Emerson College, which continued to operate the building as a dormitory. On August 22, 2006, 6 Arlington LLC purchased 6 Arlington from Emerson College. In January of 2007, 6 Arlington LLC filed for (and subsequently received) permission to significantly remodel 6 Arlington/0 Marlborough into fifteen dwelling units. On August 19, 2008, it converted the building into twelve condominium units, the Zero Marlborough Condominium. When it was built in 1929, 6 Arlington replaced two townhouses at 6 and 7 Arlington, built in 1860-1861. They had been two of four houses (4-5-6-7 Arlington) originally designed as a single symmetrical composition, with the two middle houses (5-6 Arlington) set slightly further back from the street than the two end houses (4 Arlington and 7 Arlington). The design complemented similar pavilion-style French Academic designs at 1-2-3 Arlington and 8-9-10-11 Arlington. The façades of 4-5 Arlington were significantly remodeled in 1925-1926 and again in 1993-1994. 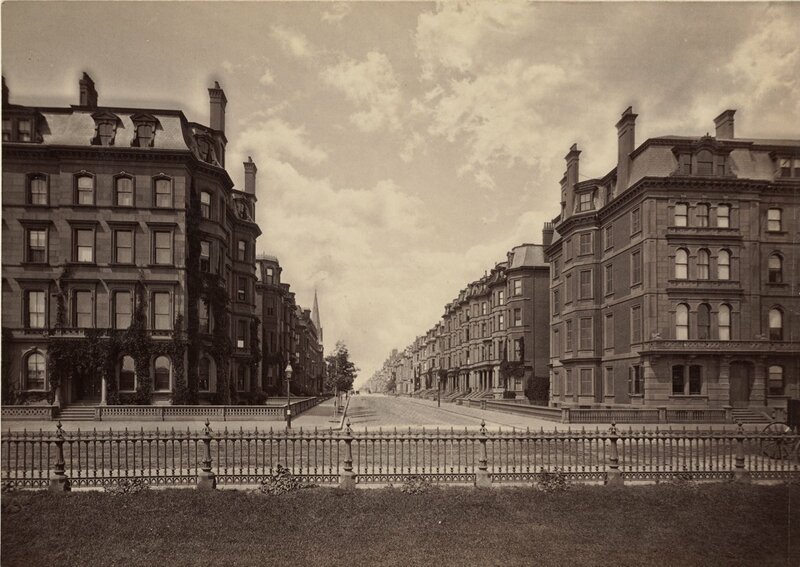 The land on which 4-5-6-7 Arlington were built in 1860-1861 was originally part of a larger tract purchased from the Commonwealth of Massachusetts on September 2, 1858, by George Goss and Norman Carmine Munson, who were the contractors responsible for filling the Commonwealth’s Back Bay lands. On the same day as they purchased the land, Goss and Munson sold it to a consortium of Peleg W. Chandler, J. Amory Davis, and Henry Lee, Jr. They, in turn, divided the land on Arlington into four lots. In April of 1860, they sold the lot at 7 Arlington to William Richards Lawrence, and in May of 1860, they sold the lot at 4 Arlington to Henry Atkins. On May 17, 1860, Chandler, Davis, and Lee entered into an agreement with William Carpenter, a carpenter, and Horace Jenkins, a mason, to build houses at 5 and 6 Arlington. On May 18, 1860, William Lawrence and Henry Atkins entered into a separate agreement with Carpenter and Jenkins governing the design and construction of all four houses to be built (the agreement does not specify that the houses at 4 and 7 Arlington would be built by Carpenter and Jenkins, and they may have been built by someone else). On September 26, 1860, Seth Simmons, a carpenter builder, bought the lot at 5 Arlington and he may have taken charge of building the house there. Click here for indices to the deeds for the former houses at 6 Arlington and 7 Arlington. 6 Arlington was completed in mid-1861 and purchased on August 31, 1861, by Josiah Gardner Abbott. He and his wife, Caroline (Livermore) Abbott were the first residents of the house. They previously had lived in Lowell. Josiah Abbott was an attorney. He had served as a member of the Massachusetts House of Representatives and State Senate, and was a Member of Congress in 1876-1877. He also had been an unsuccessful candidate for US Senate on several occasions. They continued to live at 6 Arlington in 1878, but by 1879 had moved to a new home they had built at 317 Commonwealth. On April 2, 1878, 6 Arlington was purchased from Josiah Abbott by wholesale liquor dealer Nathaniel F. Goldsmith and his wife Mary E. (Keith) Goldsmith. They previously had lived at 38 Staniford. By the late 1880s, the Goldsmiths had been joined at 6 Arlington by several of Mary Goldsmith’s nieces and nephews, the children of Phineas Keith (who had died in July of 1877) and Sarah (Moser) Keith (who had died in May of 1885): Emma Keith, Ella Keith, Harriet C. Keith, and Phineas Keith. Phineas and Sarah Keith’s eldest child, William Franklin Keith, may also have lived at 6 Arlington. Nathaniel Goldsmith died in March of 1897. Emma Keith married in October of 1897 to Albert C. Aldrich, a real estate dealer and later a tea merchant and then a dealer in construction loans. After their marriage, they lived at Exeter Chambers (southeast corner of Exeter and Blagden). Phineas Keith married in May of 1898 to Mae W. Carmichael. After their marriage, they lived in Somerville. Ella and Harriet Keith married in October of 1901, in a double ceremony at 6 Arlington, Ella Keith to William Robert Dresser, a banker, and Harriet Keith to Charles Henry Lerned, an accountant. After their marriage, the Dressers lived in Brookline. The Lerneds lived at 6 Arlington with Mary Goldsmith until about 1903, when they moved to Melrose. By 1915, Mary Goldsmith was joined at 6 Arlington by Albert and Emma (Keith) Aldrich. They most recently had lived in Brookline. Mary Goldsmith continued to live at 6 Arlington until her death in October of 1919. After her death, Albert and Emma Aldrich moved back to Brookline. On May 6, 1920, 6 Arlington was acquired from the Goldsmith estate by attorney Charles Cobb Walker, who owned and lived at 7 Arlington. 6 Arlington was not listed in the 1920-1928 Blue Books and probably was maintained as an annex to 7 Arlington (Charles Walker married in October of 1920 to Helene Whitehouse and may have acquired 6 Arlington in anticipation of his marriage). 7 Arlington was built in 1860-1861 as the home of William Richards Lawrence and his wife, Susan Coombs (Dana) Lawrence. He purchased the land for the house in April of 1860. They previously had lived at 98 Beacon. After working in his family’s dry goods and textile company, William Richards Lawrence had studied medicine, graduating from Harvard Medical School in 1845. He subsequently established a children’s infirmary in Boston. 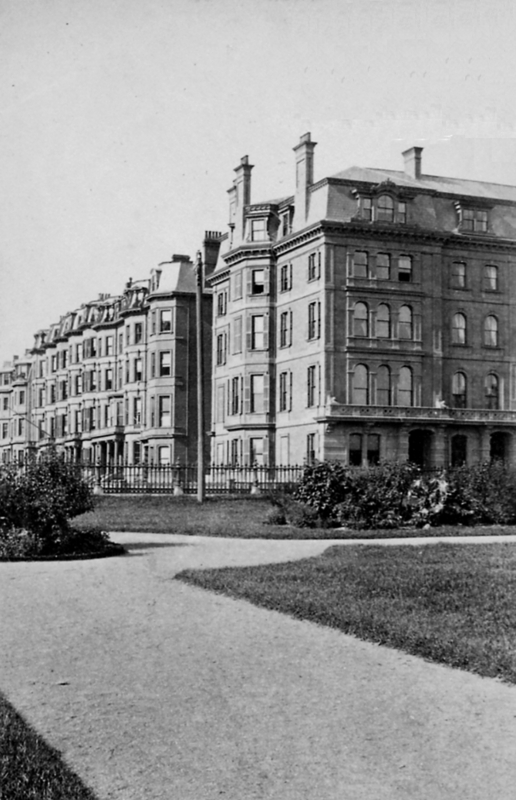 The Lawrences continued to live at 7 Arlington in 1866, but had moved to the Longwood neighborhood of Brookline by 1867. On March 13, 1868, 7 Arlington was acquired by Peter Chardon Brooks, Jr., a real estate investor and trustee. He and his wife, Sarah (Lawrence) Brooks, the niece of William R. Lawrence, made it their Boston home. They previously had lived at 6 Pemberton Square. They also maintained a home in West Medford. Peter and Sarah Brooks continued to live at 7 Arlington in 1901, but had moved to 2 Deerfield by 1902. From about 1903, 7 Arlington was the home of John Munro Longyear and his wife, Mary (Beecher) Longyear. He was an investor in timber and mining in Michigan, where they had lived until about 1900. They continued to live at 7 Arlington until about1906, when they moved to Brookline. On April 5, 1905, 7 Arlington was purchased from Peter C. Brooks by attorney Charles Cobb Walker. He previously had lived at 302 Berkeley. He also maintained a home, Woodholm, in Manchester. In May of 1920, Charles Walker acquired 6 Arlington. In October of 1920 he married to Helene Whitehouse. After their marriage, they lived at 7 Arlington and probably maintained 6 Arlington as an annex. During the 1925-1926 winter season, the Walkers were listed in the Blue Book both at 7 Arlington and at 29 Hereford. At the time, they were engaged in divorce proceedings, and 29 Hereford may have been the separate residence of one of them. By 1928, Charles Walker was living in Manchester and Helen Walker was living in an apartment at 250 Beacon. On March 3, 1928. Charles Walker transferred 6-7 Arlington (and other property) to a trust he had established to fund divorce settlement payments to Helene Walker. On May 19, 1929, the trust (John L. Hall and The First National Bank of Boston, trustees) sold 6-7 Arlington to Elliott Henderson, Frederick Holsworth, and Gladys B. Olmstead, trustees of the Six Arlington Street Trust. Both houses were razed later that year to permit construction of the new ten-story apartment building at 6 Arlington (0 Marlborough).